GREENVILLE, South Carolina -- There were those who deemed it in a class of its own, capable of breaking the Big East record of 11 teams that earned invites to the 2011 NCAA tournament. There was a loaded Duke team, and several others that were considered capable of reaching to sport's pinnacle -- the Final Four. Power at the top, depth in the middle and even the bottom had improved. There was oodles and oodles of talent, highlighted by a trio of guys -- Duke's Jayson Tatum, NC State's Dennis Smith and Florida State's Jonathan Isaac -- pegged to be taken in the top 10 of June's NBA draft. Now North Carolina stands all alone, and the Tar Heels should count themselves fortunate after nearly bowing out against Arkansas in the second round. This was the Year of the ACC. Well, that was supposed to be the case. Now, it's the Season of Disappointment for the league that was billed as all-powerful. Duke brought back Grayson Allen and Amile Jefferson to a freshman class that compared favorably to the one that included Jahlil Okafor, Justise Winslow and Tyus Jones. There were the top two players in the country, Harry Giles and Tatum, as well as two more McDonald's All-Americans: Frank Jackson and Marques Bolden. The Blue Devils were up and down all season but appeared to have found their stride at the opportune time with a four-day ACC tourney title run. Duke had no shortage of company in the 68-team NCAA tournament field. No, the ACC didn't wind up breaking or even matching the Big Beast. It landed nine in the field, but the top half-dozen was all considered potential contenders to get to Glendale and be one of the last four standing. Wake Forest was the first to go, the First Four in Dayton when the Demon Deacons lost to Kansas State. But after a weekend that began on a high note with Notre Dame's nail-biter over Princeton and Virginia's victory against a UNC Wilmington team that was a trendy upset pick, now the entire ACC's hopes for tourney relevance rest on the team from Chapel Hill, the one that needed a couple of favorable whistles to get past Arkansas on Sunday night in Greenville. Virginia Tech was the first from the league to fall as Buzz Williams' group lost to Wisconsin. Miami went down in the first round to Michigan State on Friday, but that still left seven teams out of the final 32. But the weekend wasn't kind to the Atlantic Coast Conference. Notre Dame came up short against West Virginia, Florida State was pounded by Xavier, and Virginia managed only 39 points in a loss to Florida. Sunday wasn't much better as Louisville bowed out to a red-hot Michigan team, and then Duke was manhandled and shell-shocked by South Carolina. "The league isn't very tough," one ACC assistant said. "Too much finesse. You have to be tough to win in the NCAA tourney." "It was overrated," another ACC coach added. "I'll admit it. We won games in November and December, but most of our teams weren't that much better than teams in the other leagues. But we had a ton of résumé wins on the board because of Duke, North Carolina, Louisville and even Virginia -- and that allows the other teams to become overrated." "Miami was a fringe tourney team," he added. "Same for Virginia Tech, Wake and even Notre Dame. We had a lot of good teams but really no great ones." That's because Duke just never lived up to the hype. The Blue Devils were the near-unanimous preseason No. 1 but struggled with chemistry, consistency and health. 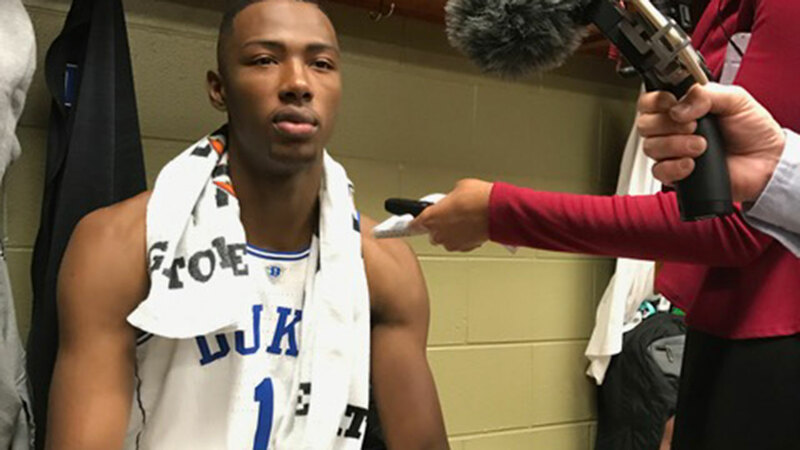 Giles was never himself after a third knee surgery just before the season, and Mike Krzyzewski couldn't find a point guard on the roster. That wasn't just the issue in Durham, either. It's tough to win in March without a quality point guard, and that was something that ultimately bit a bunch of the ACC's teams when it mattered. Duke didn't have one, Florida State didn't either and Louisville's Quentin Snider was inconsistent and struggled in the loss to Michigan. The Sweet 16 is now set. The Pac-12 has its power trio of Oregon, Arizona and UCLA. The Big 12 has its top three in Kansas, West Virginia and Baylor. A down year in the Big Ten has produced three with Purdue, Wisconsin and Michigan. The Big East has Butler and Xavier, and even the SEC, which has been a national laughingstock for years now, claims three with Kentucky, South Carolina and Florida. Then there's the ACC and North Carolina flying solo through the first week. Maybe we were right about the league after all. Maybe it was in a class of its own, the most overrated in America.